It’s been so wonderful to share these #FoodMemory stories with my readers. Each friend that has participated is talented in so many different ways. We all share a common bond that is a love of food. It’s been incredible reading the stories that have been shared with me for this #FoodMemory series. Losing my father last year left me wondering how to keep his memory alive through my blog. The obvious choice was to sometimes share a favorite recipe of his or one that reminded me of him. I had friends reach out to me sharing some tidbits about loved ones they lost and this has this series came about. #FoodMemory was about sharing a recipe and story of a loved one we lost. That’s what my next friend Karen from Karen’s Kitchen Stories is doing. If you haven’t “met” Karen and her blog yet, you are in for a treat. Her baking is outstanding. She is part of my #TwelveLoaves group and each month she shares another incredible yeast bread. Karen’s Easter bread (Pizza di Pasqua)is incredible! If you love ricotta, you have to make this Tangelo Ricotta Cake-wow! Love this Whole Wheat Cinnamon Swirl Bread. When Lora asked me if I would like to contribute to her Food Memory series, I instantly said “yes.” Cake Duchess has been one of my favorite food blogs for a very long time. Lora writes from her heart. My dad was one of those “larger than life” men. He was athletic and strong, and had a big booming voice. Other kids thought he was pretty scary, but we knew he was a big softie. He was a football player in college (isn’t he handsome? ), and had aspired to become a teacher and a coach. At a very young age, he lost his dad and had to take over the family dry cleaning business. While that was not his career of choice, he grew that business into several stores and, for many years, that dry cleaning business supported a lot of families. Having him in my life always made me feel safe. He loved his beloved California Bears, Frank Sinatra, and traveling, especially to Italy. He also loved ice cream. Growing up, we didn’t keep a lot of desserts in the house, but we always had a carton of Neapolitan or rocky road in the freezer. My dad would love to have a big bowl of ice cream after dinner. After retiring, he got to travel to Italy many times. He loved the food, and he loved the gelato. In fact, I don’t think he was able to pass a gelato stand without buying some. Dad, here you go. I’ve made you some gelato. I love you. I miss you. 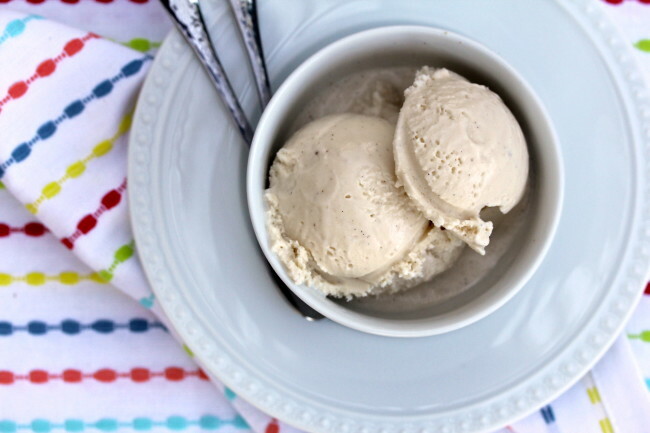 A big thank you to Karen for being a part of my #FoodMemory series…I just love this gelato!! Prepare a very large bowl with ice water. In a small bowl, combine the milk powder, cornstarch, salt, and vanilla until smooth. Set aside. medium heat, until it is just steaming but not boiling. Stir frequently. while whisking constantly until thickened, for about 2 minutes. Cover the bowl and place it into the refrigerator for about 4 hours. Freeze the mixture in an ice cream maker according to the brand’s instructions. You can serve it immediately for soft serve, or freeze and serve later. So nice to meet you Karen! I love the memories of your Father, he sounds a lot like my Dad. I miss him too! What a sweet story! My Dad was a little scary to others too, but I knew inside he was a big teddy bear. He loved frozen treats too, and would have loved this gelato, it's looks so amazing! I've always been a vanilla girl as far as ice cream goes! This recipe looks and sounds delicious! I could easily make it sugar free as well! And I love ice cream that doesn't require eggs!! There is something about the silkiness and smoothness of gelato that is just mesmerizing. Yours looks divine. Awww this was so sweet and made me want to cry. 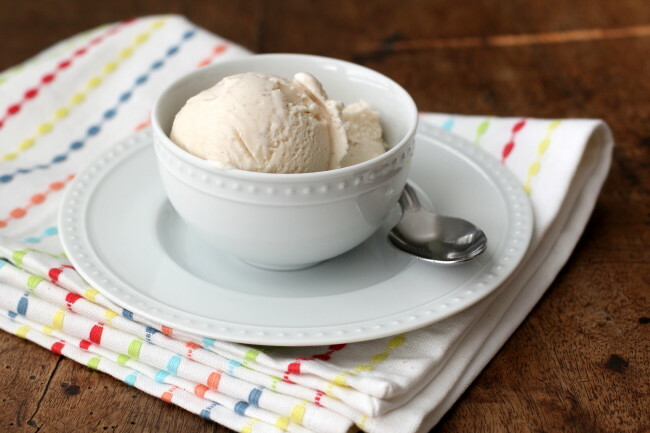 What a lovely food memory for your dad who was a lover of ice cream! Loved the photos. I love gelato and I love that you showcased the lovely flavor of vanilla. It's so delicious! These old photos are great; what wonderful memories! Oh, boy – summer is coming soon. Thanks! What a great story! Nice to meet you Karen, and what a great summer treat! I absolutely love food memory stories and have posted several on my own blog over the years. Food holds so many memories of so many loved ones. Making an old favorite recipe is, for me, a perfect way to honor those memories. ♥ I love the stories about your dad. 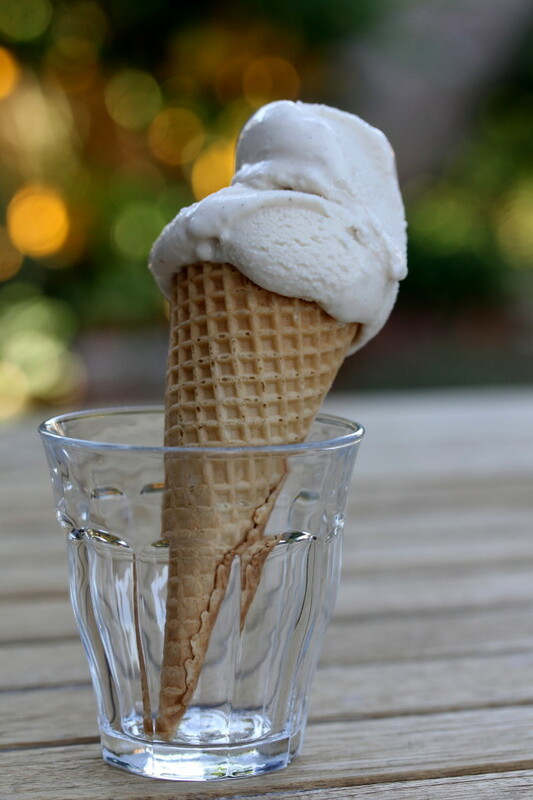 And that vanilla gelato looks perfect. Thanks Samantha =) Larger than life dads are the best. I miss him so much. I loved having the scary dad actually! I felt so protected =) Thanks Angie! Thanks Tasha. It is so great because it does not over freeze, right? Thanks Rose. This was so hard and so fulfilling. Ashley, thank you. Me too. Hi Karen! It's nice to meet you here. Your story was very touching. I personally can relate as my own father was too, a business owner and sometimes careers don't always turn out as expected but you do whatever you have to keep the family strong. PS: I'm sure he'd love this gelato. It looks amazing! Wonderful story- thanks for sharing memories of your dad. PS_ craving this gelato! I love this post! Your dad looks like great guy. What an awesome story. My dad used to have ice cream with me in the middle of the night too so I got all kinds of warm feelings from reading that. Vanilla is my favorite ice cream flavor. Sign me up. How fun 😉 So much fun, I love reading about food memories 😉 This recipe sounds amazing! I've never tried making gelato.. but this sounds like the first recipe I need to try! Yay! I just bought an ice cream maker! HI Karen – what a touching story! The photos of you with your dad are so touching. It's making me want to dig through my own stash to see what I can find. The gelato looks so good and I've always wondered how it would come out with a non-commercial ice cream maker…must try! 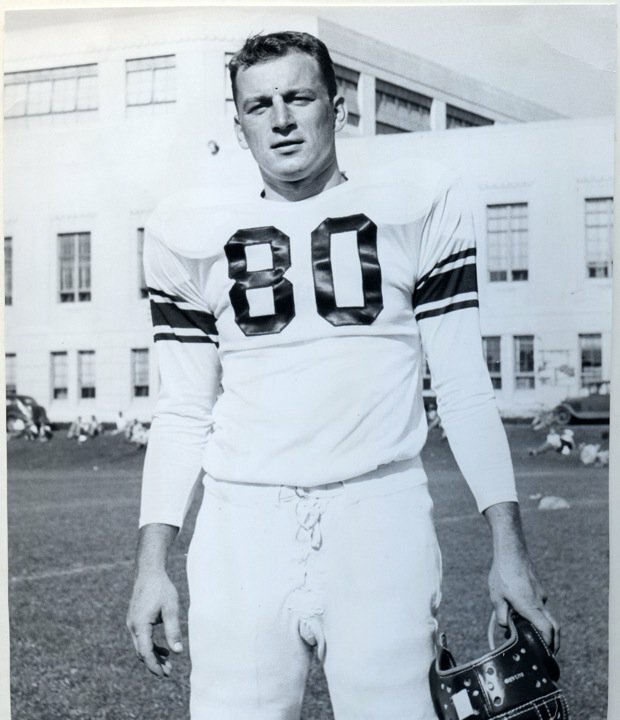 My dad was one of those big, athletic and kinda scary sounding dads too. Thanks for sharing your memories and this great recipe too! I'm so happy to meet Karen through this wonderful edition of #FoodMemory. What a heartfelt, beautiful, touching tribute to your dad, Karen (and yes, he was indeed very handsome!). And a man after my own heart – I love ice cream too and doubt that I'll pass any gelato stand in Italy without buying myself some. I love that you made his favourite dessert for this post. Your ice cream looks so rich and luscious, and the photos are beautiful. What a lovely post. Thank you so much for sharing. And as for my favorite flavor of gelato – you guessed it. Vanilla!